Do you love hoarding mini samples? Shamelessly, I do! 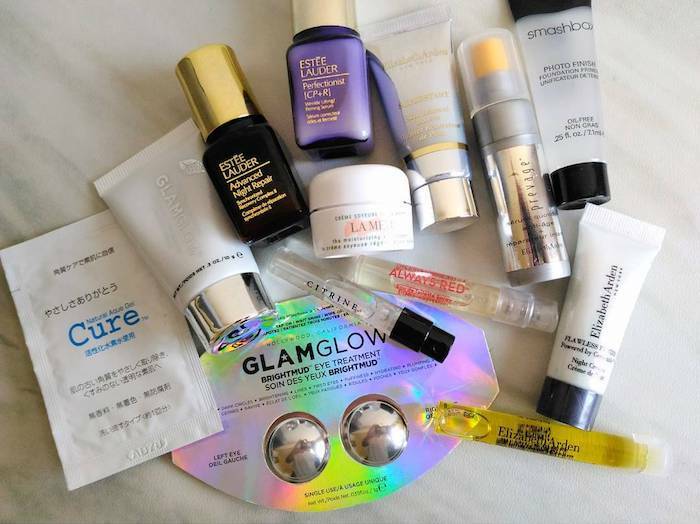 In a country that doesn't offer free product decanting (like how Sephora does), I think trial packs are the next best thing to going home with a product without much commitment. As a frequent traveler, it's also very handy for me since I can just stash in 3-5 packets and I'm all set for a weekend out of town. A week after I featured Cathy Doll, I had a biglaang lakad (spontaneous trip) with my friends. I was wearing heavy makeup and I needed to take it off before reaching our next destination. Recalling that Cathy Doll is available in 7-11 stores, we made a pit stop and viola -- my options were pretty good! Behold -- my Cathy Doll sachet stash! This stash is a combination of my brand samples and 7-11 haul hence some were doubles. Not complaining since they're actually good! First up on this review round up is the Aura Whitening Serum + Foam Cleanser. True to its namesake, this facial wash is brightens the face immediately after use without stripping the skin dry. I like using this when my facial skin looks dull and tired because it really gives me back some much wanted glow and moisture. I've yet to try the Acne Solution Serum + Foam Cleanser since thankfully, my skin is pretty clear at the moment. 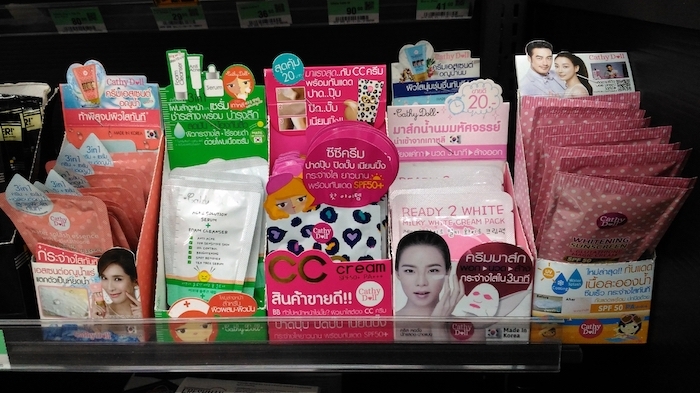 Out of all the Cathy Doll products I've tried, the Ready 2 White Milky White Cream Pack is my favorite. I like adding this to my facial care routine whenever I'm not in a hurry since I'm super fascinated by the instant results. While the instructions says 3 minutes, I like leaving it on my clean face for 10 minutes before rinsing it off with warm water. It whitens the face instantly and leaves it super supple to the touch and feel. If you find the effect too bright/white for your liking, you can always use an essence (like the ones below) to tone it down before applying your makeup. Of the three essences, I recall learning from my Phuket trip 2 years ago that the Water Splash Essence with L-Glutathione is their best seller. Unlike most essences I've tried in the past, these essences are not clear or very light hued nor runny. They're tad thicker than serums and need to be gently rubbed in a circular motion until it becomes watery in texture. Odd but crazy satisfying! 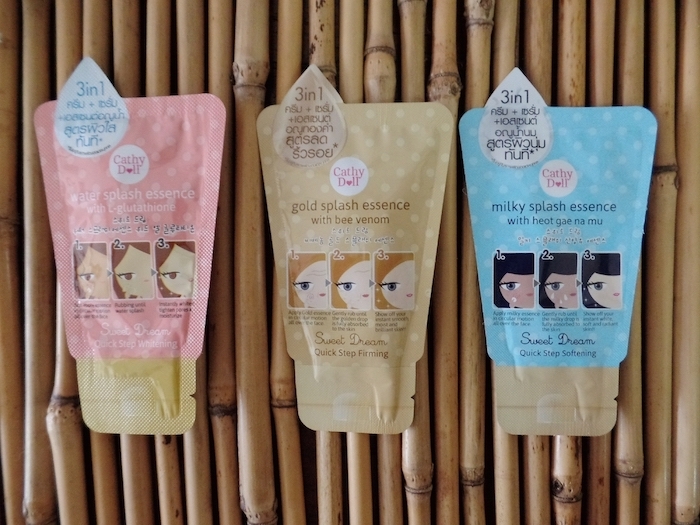 Apart from the whitening variant, they Cathy Doll also has something for firming (Gold Splash Essence with Bee Venom) and softening (Milky Splash Essence with Heot Gae Na Mu) fans. The last two products I'm reviewing today are the icings on the cake. *wink* I'm currently in between foundation shades and I like how I can get away with the Whitening Sunscreen L-Glutathione Magic Cream SPF 50 PA+++ (whew!) on light make-up days. It's an extra light sunscreen that I highly, highly recommend you try. I like that it doesn't make my skin look ghostly nor greasy because of the high SPF content. If you're looking for a new budget friendly make-up base, try the Speed White CC Cream SPF 50+ PA+++. It's silky in texture and just a little goes a long, long way! To apply, it's best pat on rather than spread all over the face to take advantage of its powdery soft finish. Lovely! 1 comment on "My Sachet Love Affair with Cathy Doll"